XE Digital Waterproof Laser Paper has been formulated for superior efficiency on 60ppm+ high speed, dry toner colour digital presses and production colour laser printers and copiers (it has also been used successfully on desktop printers). With high opacity for full colour duplex printing, XE Digital has controlled electrical charge characteristics for optimum toner transfer and vivid colour reproduction. Designed for use in harsh environments including: extreme outdoor; industrial; pharmaceutical; marine and field use, XE (XtremeEnvironment) waterproof papers are ideal for a multitude of applications where durability and printability are essential requirements. XE is manufactured from matt-white print receptive polyester laser film which prints just like paper. Durable and lightweight, it can be used straight from the printer with no need for drying time and produces quality print results on mono and colour copiers and laser printers. XE delivers immediate useful media with professional results and robust versatility. It has been used successfully for a multitude of applications across numerous industries including: armed forces; submersibles industry; deep sea diving; fisheries; hotel and catering; search and rescue; outdoor centres; extreme sports; NHS; local authorities; utilities; heavy engineering; construction; biotech companies (including clean rooms); conservation; agriculture; forestry; horticulture; orienteering; education; expeditions; etc. XE is the ideal medium for creating instruction sheets, maps, labels, charts, tags, technical manuals, signage, surveys, menus, logbooks, passes and permits and much more. 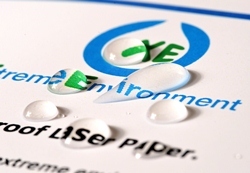 Also available in Desktop format as XE Desktop Waterproof Laser Paper which is optimised for use on desktop laser and LED printers as well as mid to low speed colour copiers and other smaller toner fusion devices. (User tip: When printing Polyesters by laser or copier methods please refer to your printer manual for optimum film settings).